September 20, 2018 September 21, 2018 - by Ed Perrone - 6 Comments. 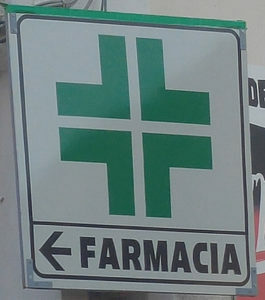 Sign for an Italian farmacia (pharmacy). The farmacia uses a green cross as its symbol, and is authorized to dispense prescription medications. The farmacista (pharmacist) is often the first stop for advice when you have a medical problem, rather than the doctor. You may or may not know that in 2012 I had a minor heart attack, caused by a blocked coronary artery. My cardiologist cleared the artery and inserted a stent, and I’ve been in good shape ever since. But he also put me on some daily medication: three different prescription drugs, plus a baby aspirin, every day. As we were planning our move to Italy, I had to give some consideration to making sure I had enough of this medication to get by until I could get into the Italian health care system and have a doctor here take over my care. We were planning on moving out of our home on June 1st, but we weren’t coming directly to Italy. Instead, we would spend the entire month of June traveling the U.S. on a “farewell tour” to visit family and friends. We would arrive in Italy on July 1st. We had registered for four weeks at a language school here in La Maddalena, and the school had helped arrange a temporary apartment for us through July 28th. At that point, we’d need to move into a permanent place. With this in mind, I figured it would be two months before we could even think of getting into the health care system, plus another few weeks to go through the process itself — so I’d probably need 90 days worth of medications to hold me over. I called the doctor’s office, explained to the nurse what was happening, and she called the pharmacy to order 90 days worth of all of my drugs. Combined with the supply I had left at home — from a couple weeks’ worth of one, to more than a month’s worth of another — I figured I’d be in good shape. I didn’t anticipate the delays that could come during the process of applying for residency (described here and here). But as we started getting toward the end of August, the supply of one of my drugs — a heart drug called metoprolol — began to get disturbingly low. I decided I’d better get myself to a farmacia (pharmacy) to discuss what was involved in obtaining and filling prescriptions before you are actually in the national health care system. “Discussion,” of course, would be a bit of a daunting task, given that my Italian is still at a very rudimentary level. But never one to shirk a challenge, I selected one morning to psych myself up, collect my bottles of medicine, and head out to find a helpful farmacista (pharmacist). Pharmacies in Italy are almost as common was Whataburgers (or churches) in Texas, so there was no shortage of opportunities. My first stop was a pharmacy just a few blocks from our apartment. But it was overflowing with customers, and I didn’t feel like waiting around, so I moved on. 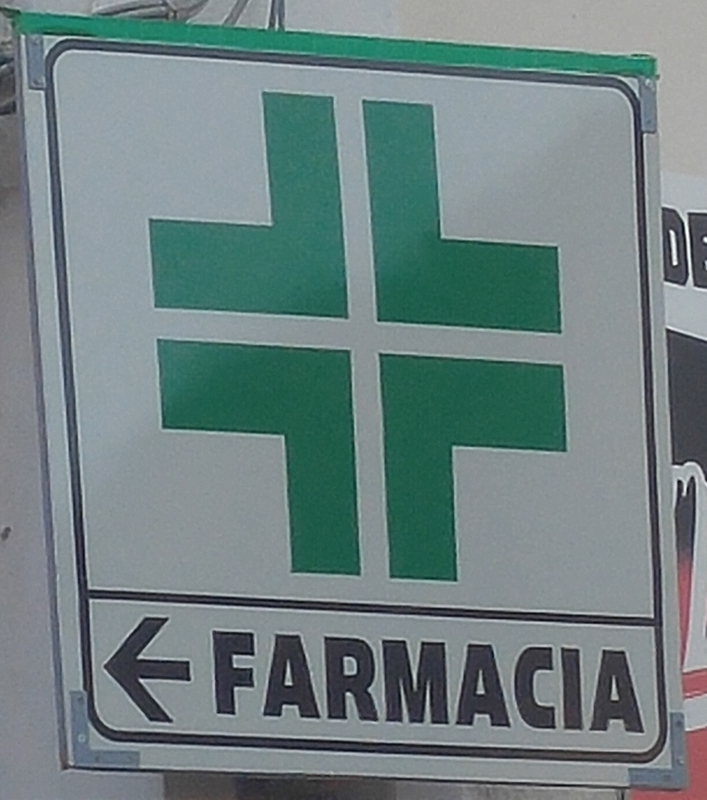 Sign for an Italian parafarmacia (para-pharmacy). 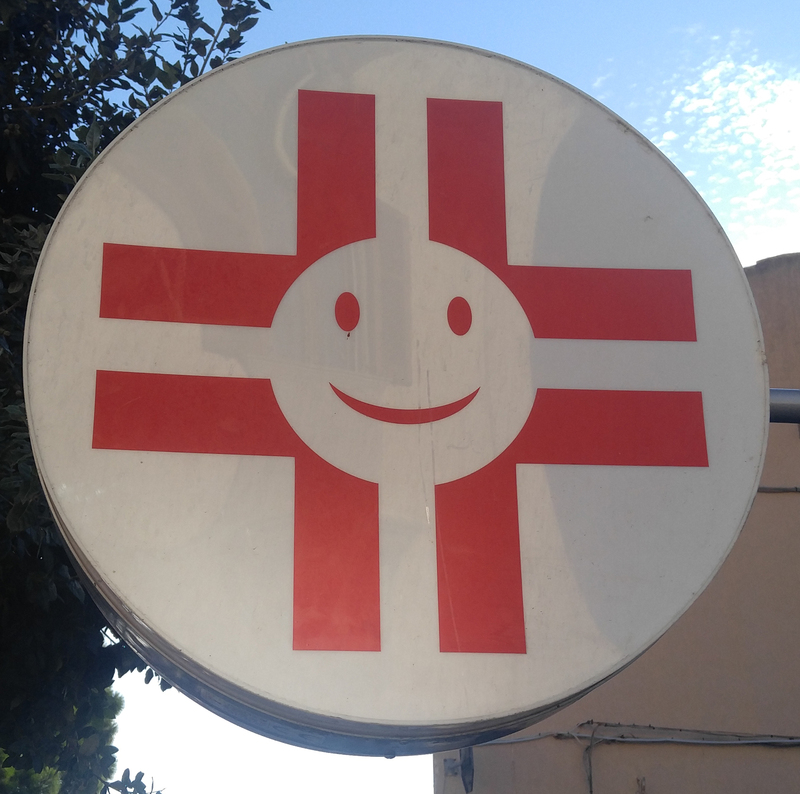 The parafarmacia uses a red cross as its symbol, and may only dispense over-the-counter medications, herbal remedies, etc. It cannot fill prescriptions. I am not sure why this sign has a smiley face in it, but I’m pretty sure that is not standard. Next stop was a pharmacy inside a supermarket — this one completely empty except for a man standing behind the counter. I went in and, in halting Italian, began telling him some of my concerns. He was extremely friendly and helpful. But the first thing he told me was that this was a parafarmacia and not a farmacia — the difference being that the parafarmacia is only authorized to dispense over-the-counter medications, herbal remedies, and so forth; while to obtain any medication requiring a prescription, you need to go to a regular farmacia. In any event, this gentleman told me I should have no problem obtaining a prescription for my medication, but that I needed to go to a regular farmacia. He also told me (although I misunderstood him at first and didn’t realize this until later) where I could go to find a doctor who would write the prescription for me. I thanked him and continued into town to find an actual farmacista, rather than a parafarmacista. Third time’s a charm. This gentleman was not particularly busy, clearly wanted to be helpful, and realizing that my Italian was on the weak side, he spoke very slowly and clearly for me. We actually could have the “discussion” I mentioned above. He also told me that it would be no problem to have my prescription written and filled. He said I needed to go to the “ASL” (Azienda Sanitaria Locale), which is the local health authority — sort of a combination administrative office and mini-clinic. He said there I would find a doctor at the Guardia Turistica, which is a special clinic open during the summer months to provide minor medical services to tourists. He said that although I am an Italian citizen, since I have not yet officially established residency in La Maddalena, I am considered to be a “tourist” for these purposes. He told me where the ASL was located, and I told him I would go there. He then went to his computer to look up my medication, and came up with a surprise. My prescription for metoprolol is for 25mg tablets, of which I take one-half of a tablet every day. 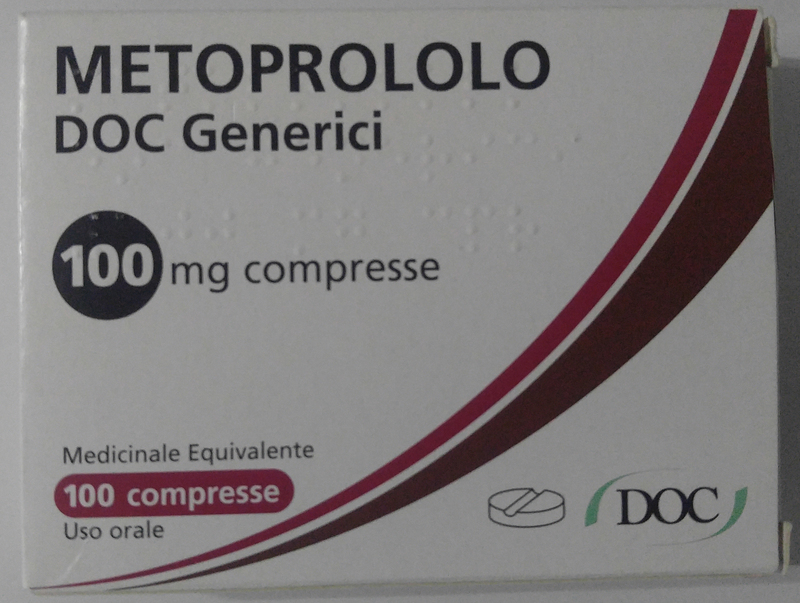 But when the farmacista pulled the info up on his computer, he told me that they do not have 25mg tablets of metoprolol in Italy. “Non esiste,” he said. (“Doesn’t exist.”) The smallest dosage they have in Italy is 100mg. Yikes! So I would have to cut the tablet into eighths? Hmmm…. Well, we’ll cross that bridge when we come to it. Aspirinetta, the Italian equivalent of baby aspirin. The dosage for baby aspirin in the U.S. is 81mg. Aspirinetta in Italy is 100mg. Close enough. He explained that an 81mg dose of aspirin does not exist in Italy. The smallest dosage you can buy is 100mg. It is called aspirinetta. Regular-dosage aspirin is aspirina. I explained to him that it was for cuore (heart), for sangue (blood) and he nodded, understanding why I was taking it. After making sure I was doing this on the recommendation of a doctor, he told me the 100mg would be fine. I purchased a package — 30 tablets for four euros and change (nearly $5.00 USD)! In the U.S., you could buy these pills a couple hundred for a couple of bucks. Good thing the medical care is going to be cheap here, because the OTC medications obviously are not…. A few days later, Vicky and I decided to go over to the ASL and see if we could find the doctor to write my prescription for the metoprolol. The building is a bit across town, so we took the bus to get there. And, again, I had to break out the basic Italian in order to find the proper office, and then to explain my issue to the doctor. The doctor had no problem writing me a prescription. She, too, looked up the drug on her computer and told me that the smallest dose available was 100mg, which is the dosage she put on the prescription. She made sure I understood that I was going to have to cut the tablets before taking them. She charged me a whopping 8 euros for this consultation — probably about a half-hour or so. Would that doctor visits in the U.S. had been so cheap! My box of metoprolol. Because I only take 12.5mg per day, this box contains 800 days’ worth of medication. But I have to cut the pills into eighths. I noticed the prescription did not even have my name or the date on it, just the name and dosage of the medication and the doctor’s signature. When I took it to the farmacista (the same one I had spoken to before), he just went into the back, took a box of pills from the shelf, and brought them out for me. No waiting, no fancy labels, no putting me into the computer system, no nothing. He wrote something on the prescription — I presume to cancel it — then gave it back to me with the pills. The package of 100 tablets at 100mg each cost 8 euros and change. The last prescription I got in the U.S. — 45 tablets at 25mg each — cost $15 USD. OTC drugs may be expensive in Italy, but apparently prescription drugs not so much. And if you do the math here, you’ll remember that I only take one-half of a 25mg tablet every day. That means each 100mg tablet provides me with eight doses. A hundred tablets in the package means I have 800 days’ worth of medication here — that’s more than two years’ worth! I thought they might expire before I run out, but I looked at the expiration date and it is in 2021 — three years down the road. So I probably won’t have to worry about running out of these pills for a good while. Finally, if you take a look at the two pictures of medication, you will notice that both boxes are labeled in Braille. I found out that this has been an EU regulation for some years. Interesting, eh? Don’t forget to go over to EndlessJourneyTravel.com to read Vicky’s blogs about our new life in Sardinia! Hi Ed, great job tackling your medication issues. I have found that the drugs here are much cheaper, and since I am a permanent resident with all documents and papers ( I married an Italian) and my doctor visits are free, as well as any Pronto Scorso ( ER visit) .. know from experience here in Milan. Good luck, there are always new adventures to tackle here! Thanks, Ella. Always new adventures is an understatement! 🙂 I guess that’s part of why we’re here, eh? I’m glad that you were able to get your medication. The reason why aspirin is so expensive here is because only the Bayer company can produce and sell it in Italy, so there is no generic brand. Ahhhh.. That makes sense, thanks. Ed, I love your blog! I’m really enjoying reading your posts. I chuckled at this post because I always smile when I see a pharmacy in Italy. There are so many of them. 🙂 I’m trying to convince my dad to retire in Italy. Maybe I’ll show him this post–he loves a good deal and healthcare is definitely a good deal in Italy. LOL. Thanks, Audra. These posts aren’t even the half of it. There were some experiences that I looked back on and got exhausted just thinking about them, so I couldn’t even start to organize them for writing. Like the three or four days Vicky and I spent with a translator we hired (a young lady about your age) trying to apply for Vicky’s carta di soggiorno — running around three towns in a 50-mile radius with only the bus system and our feet to carry us. Go here, now go there, now go back over here, now go over there…. Sheesh! Our translator was amazing — she just barreled (and charmed!) us through the red tape. But… this was in September, and the official document still hasn’t come through. Vicky has done some blogging about the more “human” side of our move, it is at endlessjourneytravel.com.